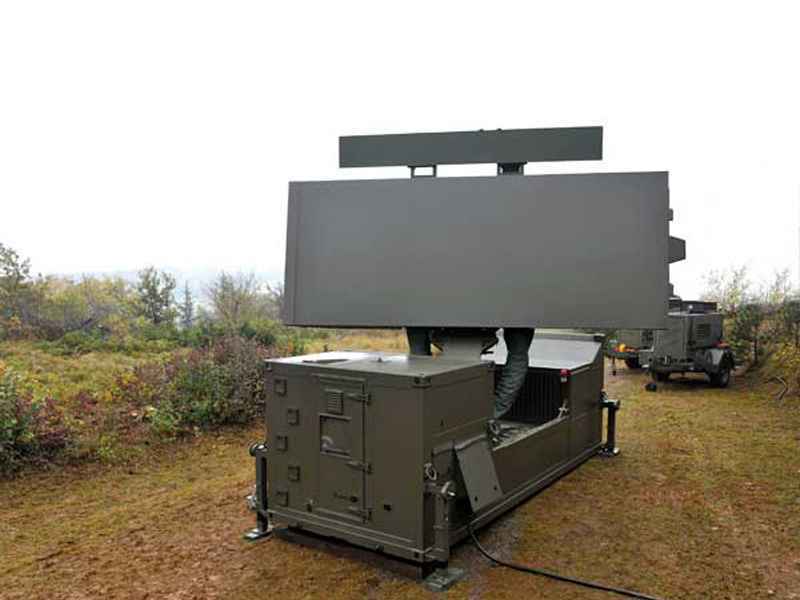 The Ground Master 400 is part of ThalesRaytheonSystems’ (TRS) fully digital 3-D air defense Ground Master radar family using digital beamforming. The GM 400 is a 3D long-range radar, offering detection from very high to very low altitudes. It tracks a wide range of targets from highly manoeuvrable low-flying tactical aircraft to unconventional smaller targets such as UAVs, ensuring an excellent wide-area air picture. GM 400 is an AESA radar that can be set up by a four man crew in 30 minutes. The system fits in a 20 foot shipping container and weighs less than ten tons. When deployed on site, the radar can be connected to operate as part of a networked air defense organization and can be controlled from a remote location. The radar is credited with range accuracy of 50 meters, an azimuth accuracy of 0.3 degrees and an altitude accuracy of 2,000 ft. at 100 naut.mi. distance. Resolution in range is given as 200 meters and as 3 degrees in azimuth. The radar features electronic stabilization between -6 and +5 degrees. The radars can be operated either from the radar site or from a remote center. They are integrated into the German Air Surveillance network. The radars are in production at the factory site of THALES in Limours, France in cooperation with Euro-Shelter, GTIE Air & Defence, LATecis - Latécoère group, Schleifring and Sermati. Since the product launch in 2008, the GM 400 radar has already been purchased by Canada (2), Estonia (2), Finland (12), France (2), India (20), Malaysia (1) and Slovenia (2). TRS, which includes Thales Deutschland, and Steep GmbH located in Bonn (former: SERCO GmbH), and EADS Deutschland GmbH in Unterschleissheim, is supplying Germany with six Ground Master 400 long-range air defense radars. EADS will supply the identification friend-or-foe module MSSR 2000 I for the radar sets. The contract is for the Aktives Radarrundsuchgerät für den Einsatzführungsdienst (ARED) program and is valued at about $140 million. TRS and Thales Germany will work with local German companies, to replace the six Thales Medium-Power Radars supplied in the late-1970s. TRS is contracted to supply the new radars by 2015. The GM 400 family includes the GM 403 and the GM 406. The GM 406 has a transmitter which is twice as powerful as the GM 403, giving it a 20 percent greater range. The GM 406 is primarily designed to equip fixed sites, with the GM 403 designed to be deployable. Mounted on a fixed tower, the first of six Ground Master 406 has entered into service. It is installed in Auenhausen (Westphalen), the GM 406 has completed extensive compliance procedures and an operational test campaign. On site validation of the second radar is in progress at the Lauda-Königshofen (Baden-Württemberg) radar site. The third radar was delivered at the site Visselhoevede. Other sets were installed in Brekendorf, Erndtebrück and Freising.